Open Mic is a live show where audience members may perform at the microphone. These shows provide an opportunity for musicians, singers and performers to gain experience before a live audience. Regular or one-off Open Mic nights can be arranged at your venue. Two hours of live music will be guaranteed, the basic equipment will be provided and your event will be promoted through dedicated websites, local radio and other publications. The event will be videoed and photographed and the resultant material will be made available for your website, if required, and uploaded to the official open mic website. 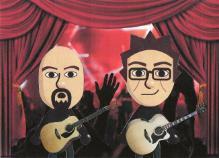 Sedge and Jon have been running Open Mics along the South Coast since 2009. Sedge has over twenty-five years experience playing in bands, duos and as a soloist. He currently performs solo and plays in the duo and band Beaten Tracks with Jon. Jon plays lead and rhythm guitar in the tribute band REMbrandt as well as playing and singing in his band Beaten Tracks. He also teaches guitar, and runs the acoustic music clubs.